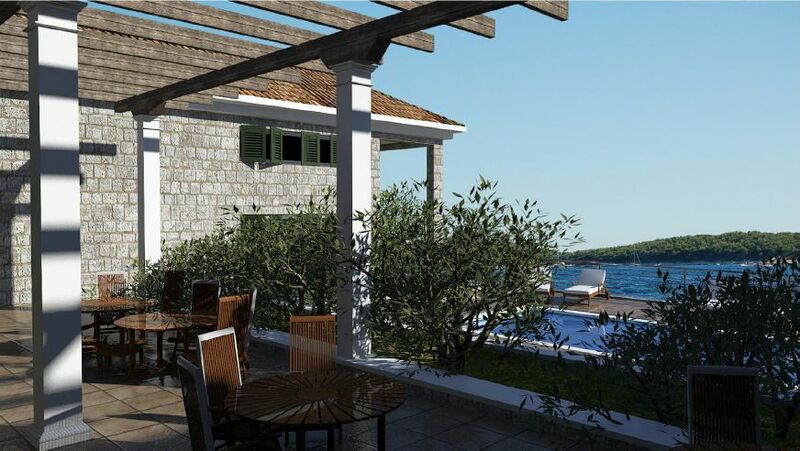 An older house is offered for sale on one of the most attractive locations on the island of Brac. 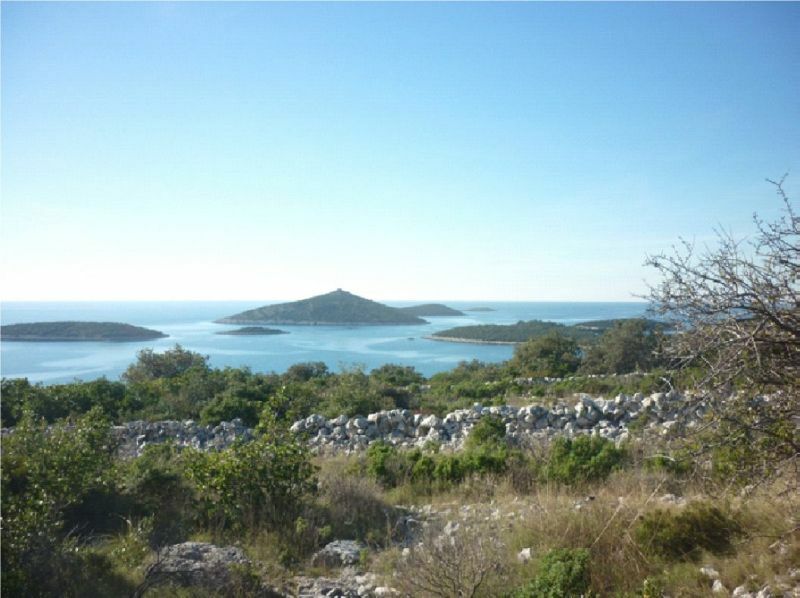 An attractive property located on the southwest side of the uninhabited Middle Dalmatian island. 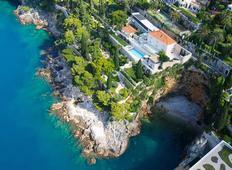 The house is located in a small romantic Dalmatian place with beautiful beaches and exceptionally clean sea. 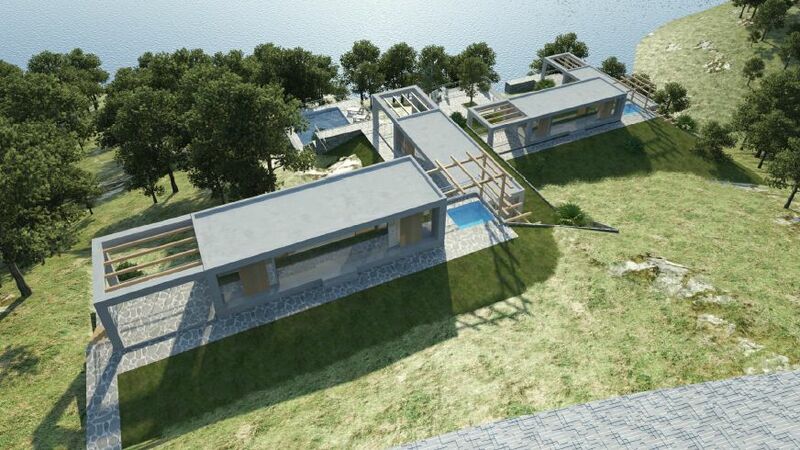 The catering – hospitality zone is located in the southern part of municipality Marina, in the Škatalac bay, between the villages Sevid and Vinišce. The zone covers an approximate surface area of 50 acres, taking in some 1400 meters of coastal line and reaching from 200 – 600 meters inland. 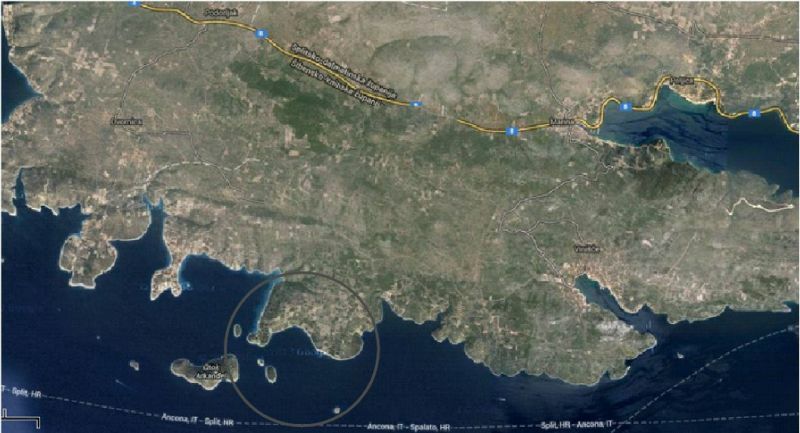 In its northwestern part, the zone borders with the archaeological zone in bay Stari Trogir. The surface characteristics of the terrain show typical vegetation for this region, mainly carst rock formations covered with low plants and some olive trees. The morphology of the area is particularly emphasized by the hills (112 and 65 meters above sea level), dominating the views from the sea. 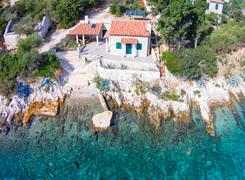 The tourist settlement is located in a secluded bay, with views onto the islets Merara, Arkandel and Kosmac, at the same time it is not very distant from other urban settlements and towns (Sevid-2km, Trogir- 20km, Split-50km, Šibenik- 35km). The zone will be connected to the bypass road Sevid-Vinišce and then onto the national road D8. The zone is 25 km distant from airport Split (Resnik). 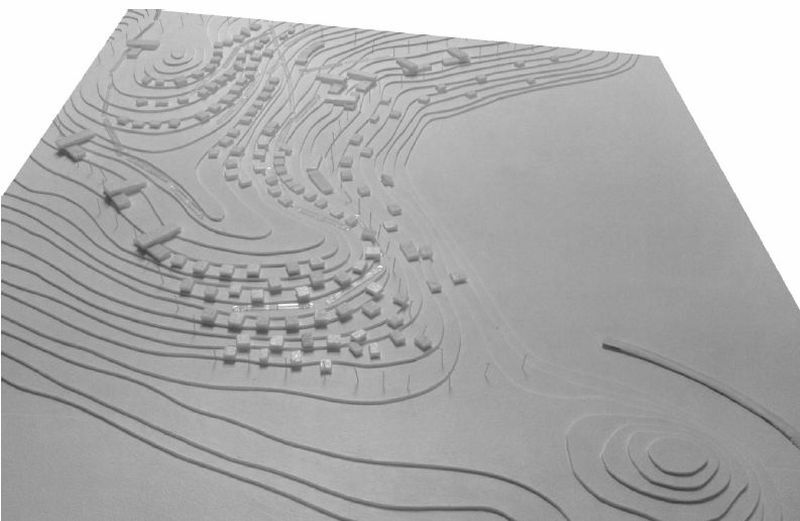 The surface area - plots for this project consist of a diversified terrain of a tactile and visual high level quality (series of naturally structured plains, canyons and cliffs, direct sea experience etc. ), with a favorable southern orientation, which guarantees insolation throughout the day. The catering – hospitality (tourism designation) zone represents, based on spatial development plan definitions, a separate building area for a settlement, in reality a newly planned, undeveloped zone. The importance of such preservation must be justified by adequate, proper transformation of undeveloped, natural ground through offering certain comparative spatial qualities (landscaping, free surface areas, parks etc.). 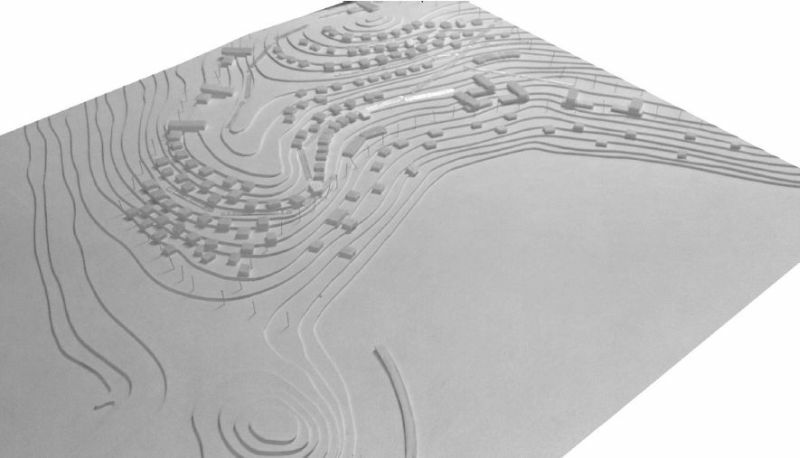 The offered spatial quality must be taken into consideration and indirectly improve the wider area of the Municipality by establishing a new attractive point of interest or place for relaxation. The rational usage and protection of the space represent the crucial preconditions for access to any type of development in the zone area. 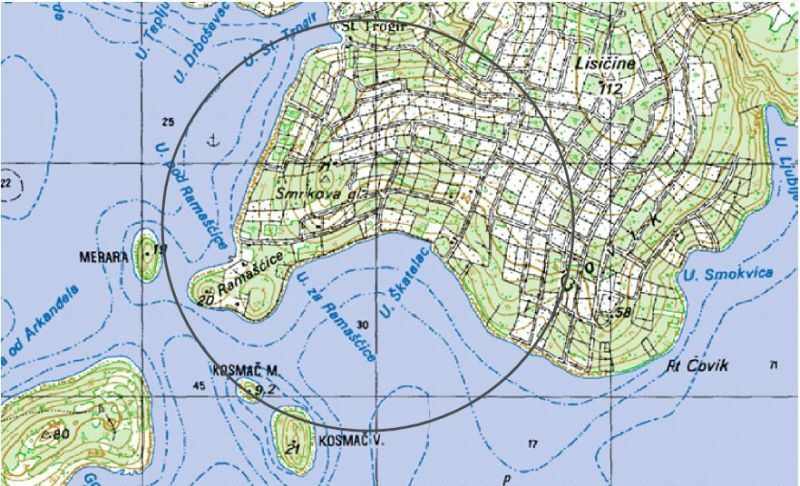 By spatial planning documentation of the wider area, the value of natural characteristics and values is especially emphasized and some remains of archaeological heritage in immediate vicinity to the project location have been registered (archaeological zone Stari Trogir), which means that a special relationship must be established with this protected area. Speaking of the building works in the zone, the development project should be organized in development stages – phases, to minimize the effect of sudden changes to the environmental structure. The surface area of the zone (some 50 acres) is a significant area that needs to be properly developed in the technological sense (traffic, infrastructure and similar). At the same time all planning works must be in favor of rational management of the existing „green“ ressources and also over the newly planned green areas. The primary goal is to set up a useful, rational watering and waste water treatment system. This solution should offer an optimized option and a balance between energy consumption through watering and the effect that is achieved by such watering. 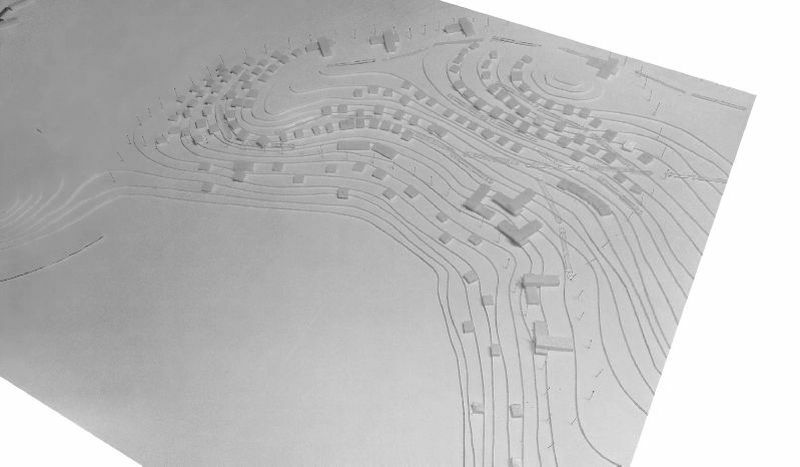 The spatial development plan of Municipality Marina defines the maximum capacity of this zone of 2200 beds. 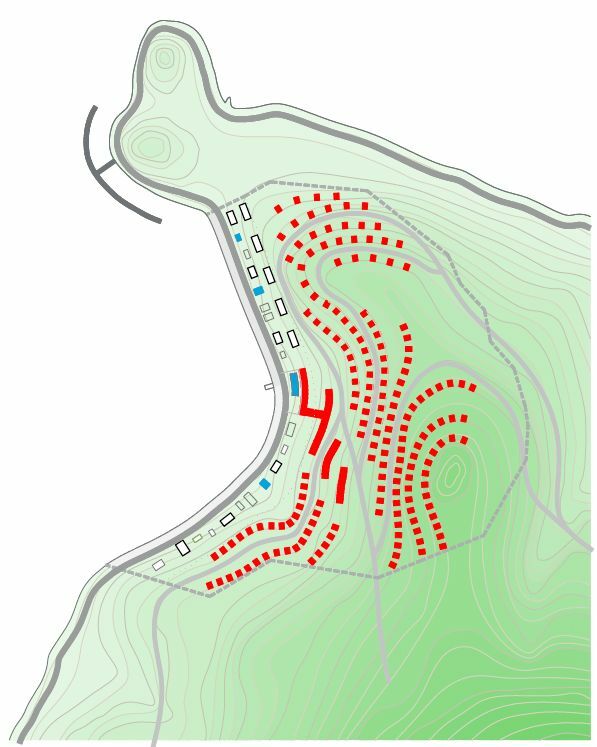 The basic accommodation facilities are to be developed through two types of objects: Villas and the main hotel building (min 30% of overall capacity), which defines the shape and form of the detailed zoning. Since we have a significant surface area, the project as a whole should be developed through individual phases. By space and function, the zone is divided into three basic parts. The zones are connected with each other through green areas and pedestrian paths of 10 – 15 meters width, at the same time acting as main pedestrian communication routes towards the sea and with development of additional facilities along such paths, like information points, rest zones and similar. From this basic division the project development in phases can be extracted (presented on the next scheme – development phases of zone ). The traffic/communication and infrastructural systems represent the basis or „skeleton“ of the zone. Their definition establishes further division of the main zone areas into smaller functional units. All systems are planned at optimum, which means that a later logical expansion and immediate satisfaction of all needs of the zone in general is given. At the same time, together with development of the planned objects and infrastructural systems, the landscaping project and „in situ“ protection of registered, valuable elements of natural and cultural heritage will be maintained. 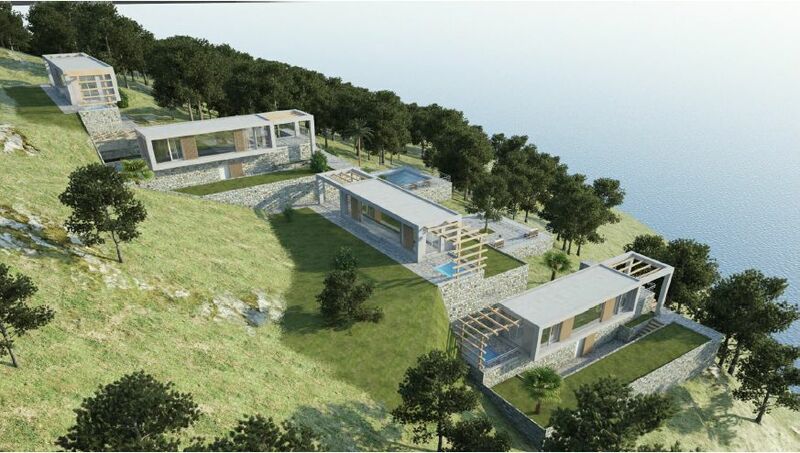 The first phase of the project development is the functional unit marked as “I”, immediately linked to the seashore. The main building of this zone is the hotel building that covers a significant surface area compared to the surface areas of the villas. The size of this building also demands adequate space and surfaces for development of basic facilities (ground floor), but also all necessary surface areas for additional facilities (wellness, conference halls, restaurants etc. ), which means that this needs to be properly dimensioned in order to accommodate all these facilities (the precondition is to comply with all spatial indicators). Consequence of this is that the surface designated for the construction of the hotel is the largest one in the entire zone. 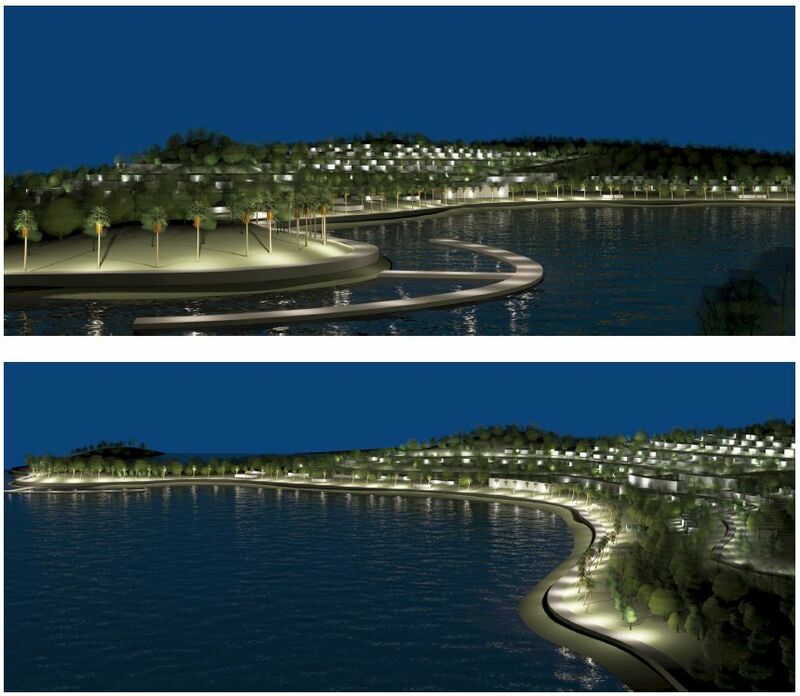 Along the seashore, a green strip will be integrated with a shore promenade and beach objects, as well as sports grounds. The beach is partially manmade, partially natural. 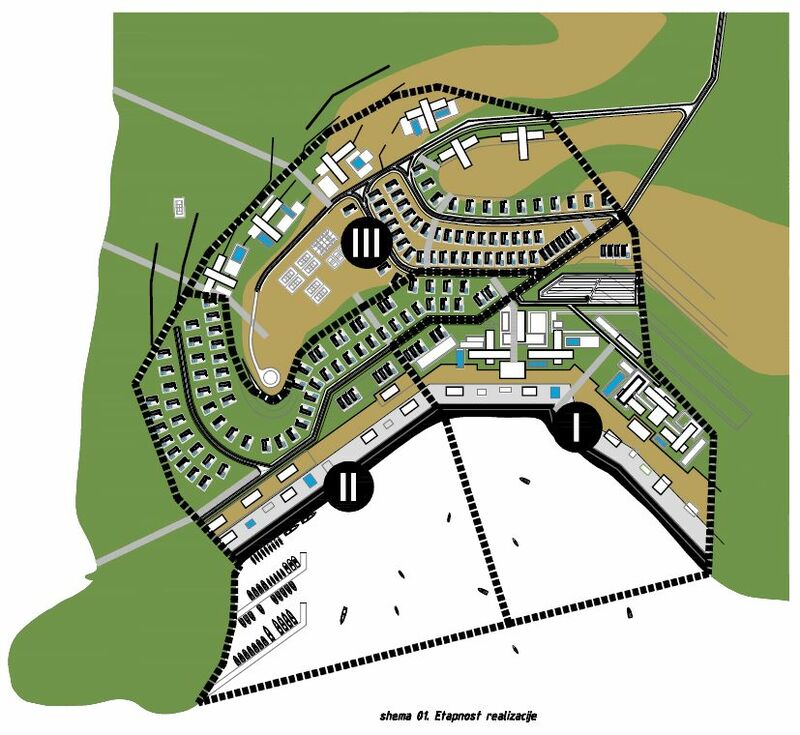 The second development zone is the area marked as “II”, as functional extension of the primary zone, containing the villas and their facilities. 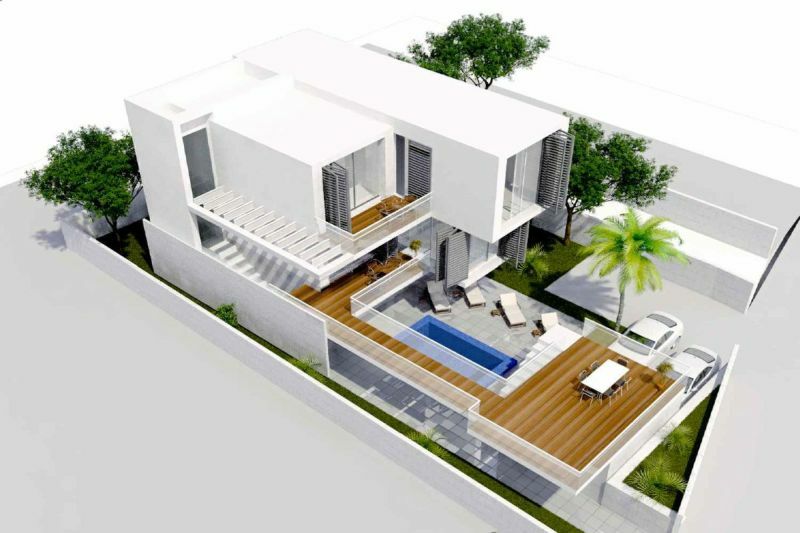 The basic typology is established by connecting all villa structures with all other important parameters of the zone (natural, functional and other..). 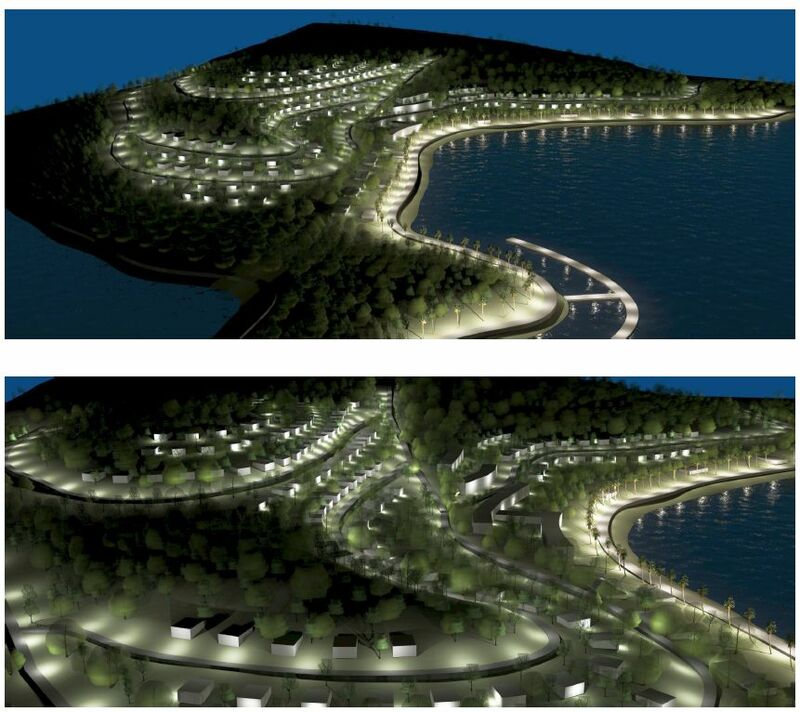 The center of the settlement will be by the sea, with all catering and commercial facilities. 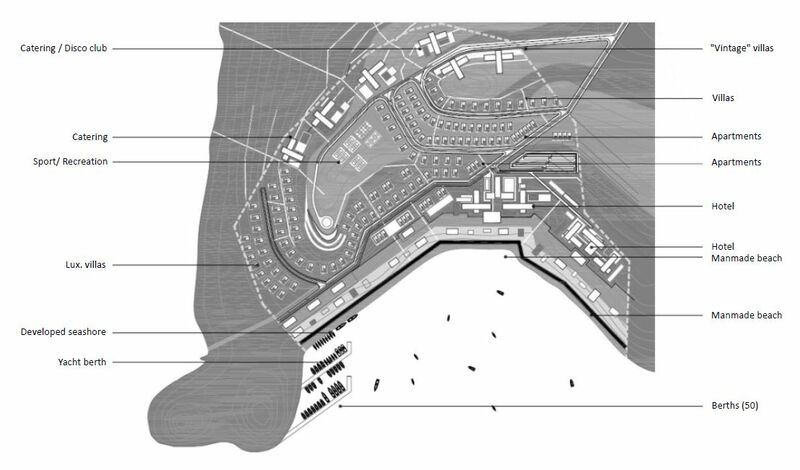 A berth area for yachts will be created also in the zone, of a maximum capacity of 50 berths. After completion of this phase, the north area of the zone around hills will be developed with a recreation zone, including a variety of sports facilities and promenades/walking paths. Other public facilities are located along this northern border of the zone area, that increases the overall quality of the settlement, which also enables a prolongation of the tourist season over the whole year. 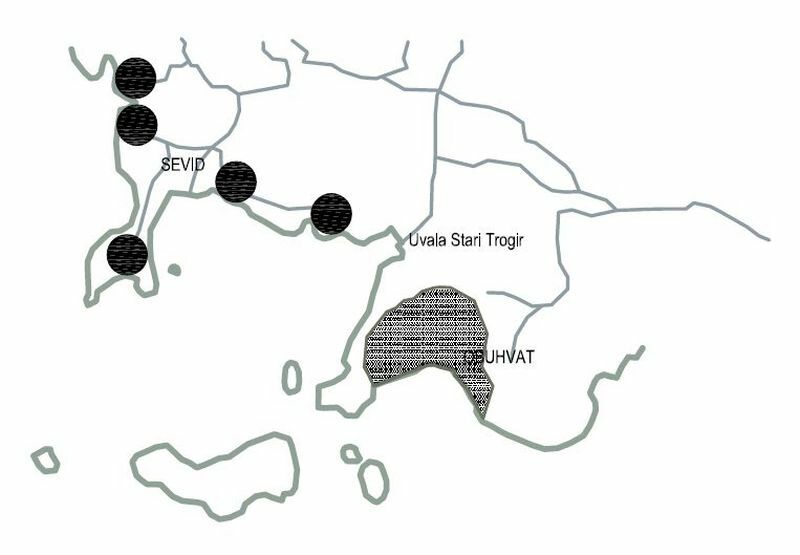 These facilities are a congress center, a complex of sport's halls and swimming pools, a research center linked to the archaeological zone "Stari Trogir". The basic designation of the space is defined as catering/hospitality zone for tourism, including necessary facilities, necessary infrastructural corridors and open, green surface areas. The catering – hospitality zoning is differentiated into two basic designation groups, i.e. group one that represents surface areas for the construction of buildings type hotel, with planned 800 beds capacity and necessary facilities and group two, including zones for the construction of accommodation objects of type tourist settlement, with another 1400 beds. The basic catering /hospitality designation of the area with accommodation units stretches up to a maximum of 100 meters distance from the seashore. The next planning category based on importance and surface area is the category of green areas. The peaks are such a green surface area containing recreational facilities, partially landscaped. Also, all vertical green corridors within the zone are landscaped as green zones, including facilities like walking paths, resting areas and a strip of 100 meters towards the seashore. In this strip of 100 meters width towards the seashore it is possible to construct smaller facilities and supplements to the basic catering – hospitality facilities of the zone and the sport's facilities. 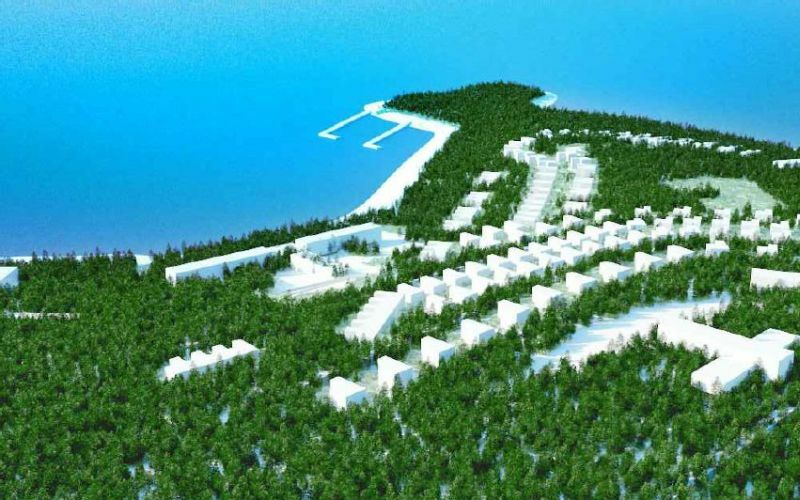 The most attractive facilities are located at the seashore, which will be developed as partially manmade and partially natural, with a waterfront. The berths for yachts are located in the western edge of the zone area. A maximum capacity of 50 berths is planned. Infrastructural corridors for communication and traffic connect all areas of the zone and also highlight the boundaries between free building areas. The infrastructural corridors are generally planned under taking into consideration possible visual impacts and impacts onto the morphology (sloping of the terrain), as well as other functional criteria. This needs to be done to maximize the solution of the project design. The main entrance gates into the zone are located in the north-eastern part of the zone, with main access to the primary traffic network of the zone, offering direct access to all central facilities of the zone (hotel building), as well as other zone parts. This network is divided into primary and secondary streets – traffic routes. The main traffic routes enable efficient connection between all three functional units of the zone. The width of these traffic routes is sufficient for two-directional traffic, with pedestrian sidewalks and decorative lining with trees, enabling parking in certain parts. 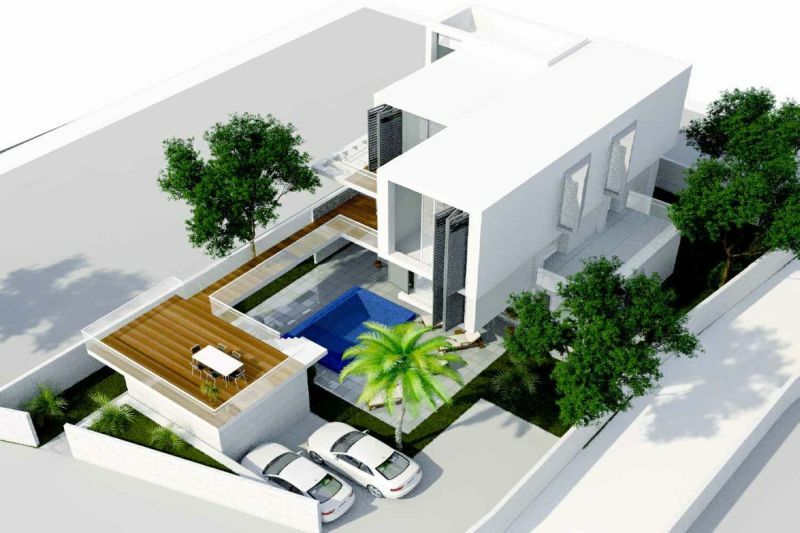 All villas have car access and adequate number of parking spaces. Parking zones are also established in the hotel zone and the central zone. 2.1 Conditions and types of construction works. The basic terms and conditions for planned construction works are defined based on typology of development, distribution of object locations and possible environmental impacts. As a whole, the zone represents an undeveloped surface area, which means that it is designated for new development/construction. 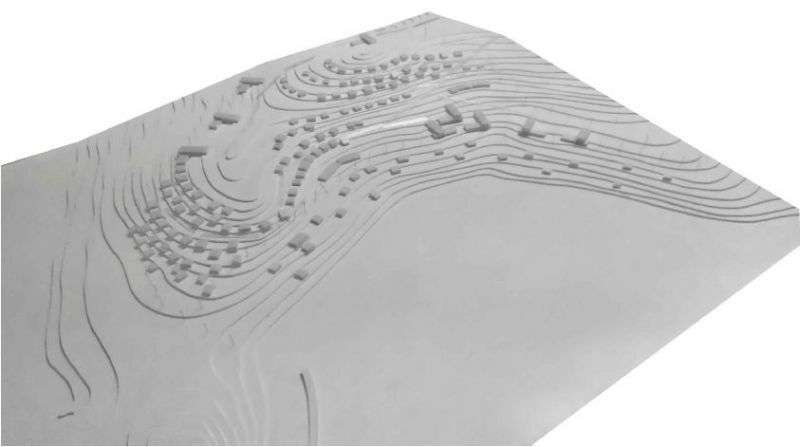 The planned typology of development in the zone is of detached type objects, organized in two basic typologies of accommodation objects: Hotel and villas. Speaking of permitted height of buildings, villas will have a max. basement + souterrain + ground floor + 2 upper floors, maximum height 12 meters. Hotels can be built to a maximum of basement + souterrain + ground floor + 5 upper floors, maximum height 23 meters, while construction of multiple underground levels is permitted. Maximum coverage/development of plot is 30% (kig=0,3), maximum utilization of space is 80% (kis=0,8). At least 40% of the surface of each building plot must be landscaped/kept as green area. 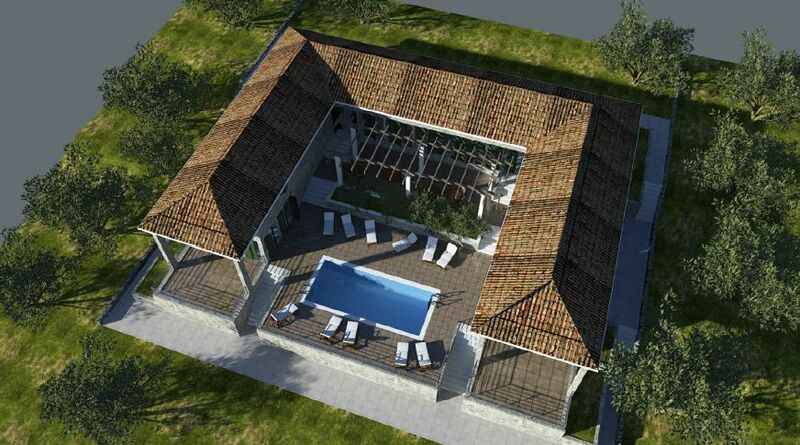 The basic structure is defined by two types of objects – Hotel and villas. Speaking of the characteristics of the terrains morphology and the natural quality of the zone, the visual image from the sea and from the individual object onto the sea is to be maintained. 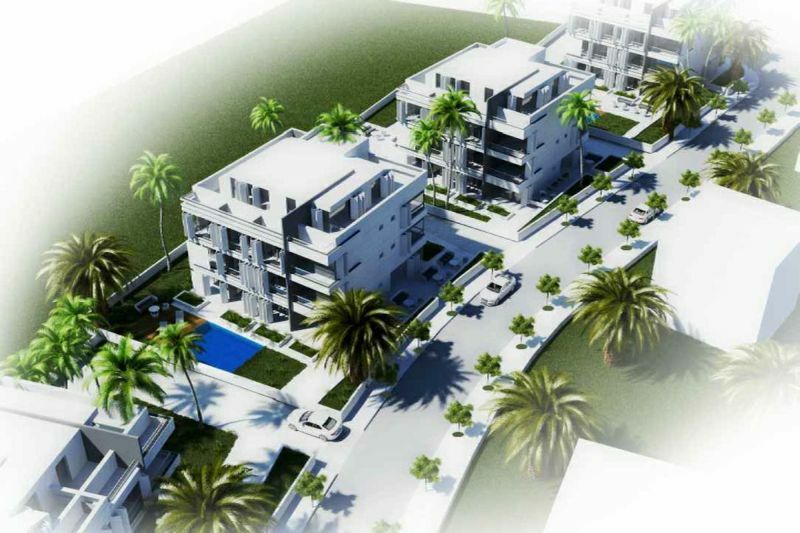 The main group of buildings is placed into the zone respecting all the above criteria. This can be achieved by avoiding sensitive natural formations (riffs, inclined slopes and similar) and by avoiding a monotonous rhythm of volume of the individual objects. The first group of objects is the hotel building with all facilities (restaurants, wellness, conference halls, commercial facilities). 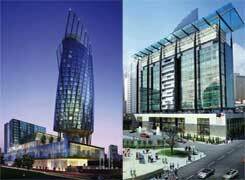 The capacity of the hotel is 800 beds (400 rooms). The main volume of the hotel is such, that the hotel building with the accommodation units doesn't enter the borderline of 100 meters distance from the sea. The maximum height of hotel buildings here is basement + souterrain + ground floor + 5 upper floors, maximum height 23 meters, while construction of multiple underground levels is permitted. 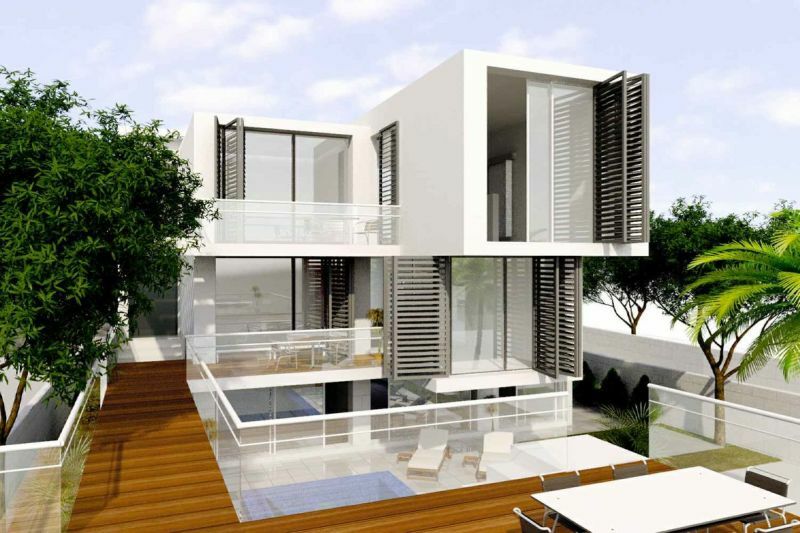 The other type of objects are buildings for individual accommodation of type – villas. 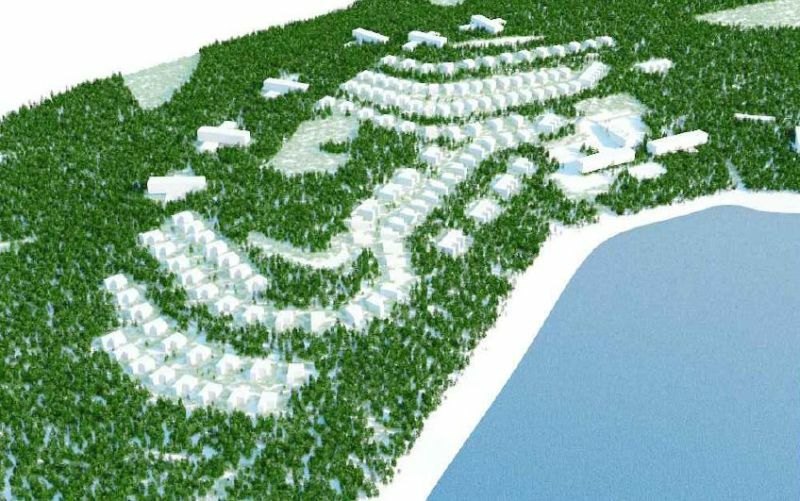 A total of 150 villas is planned, of these 30 of apartment type. Their dimensions in surface vary between 100 m2 to 300 m2 , while the courtyards range from 400 - 1000 m2 surface. 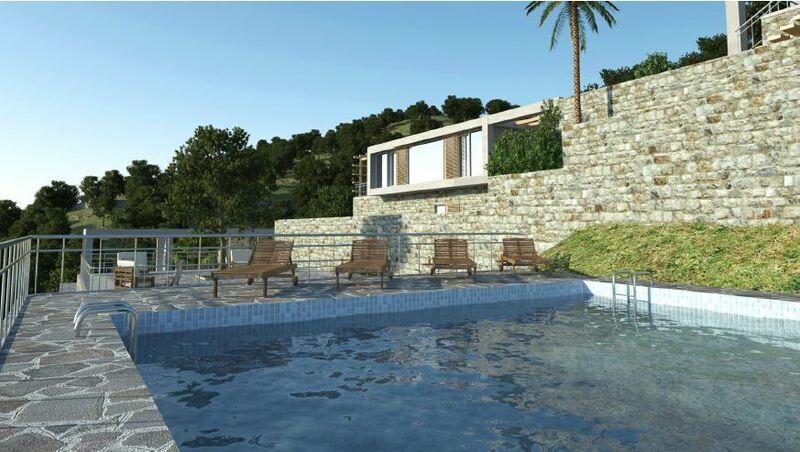 The villas are primarily located in more quiet parts of the zone and their quality is improved by gardens with swimming pools. 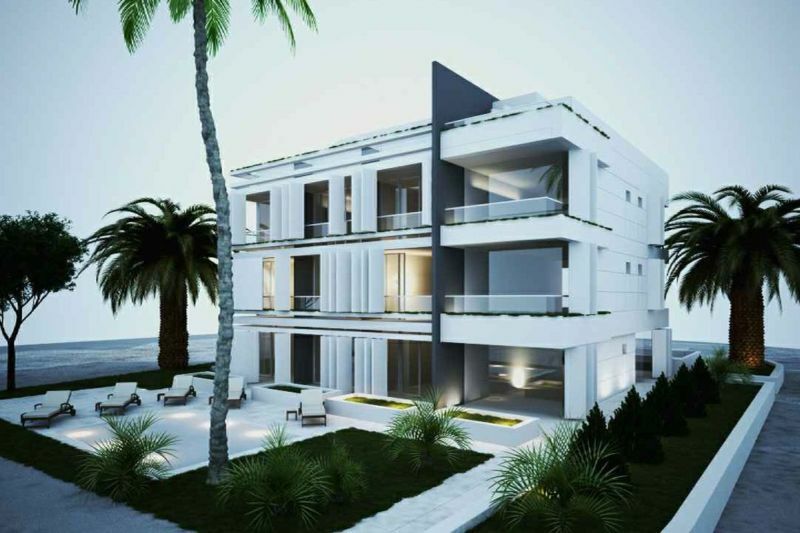 The units of apartments have surface areas of 50-100 m2, with 2-8 beds. The third type of objects are the objects within the 100 meters wide strip towards the seashore. These are hotel facilities like - wellness, conferences, shops, restaurants, playgrounds for children, sport facilities and swimming pools. The central group of facilities connected to the hotel building are the wellness center, swimming pools, conference hall and restaurant, with access organized over several levels – terraces and pedestrian paths, leading ultimately down to the sea, the promenade along the sea and the central beach area. 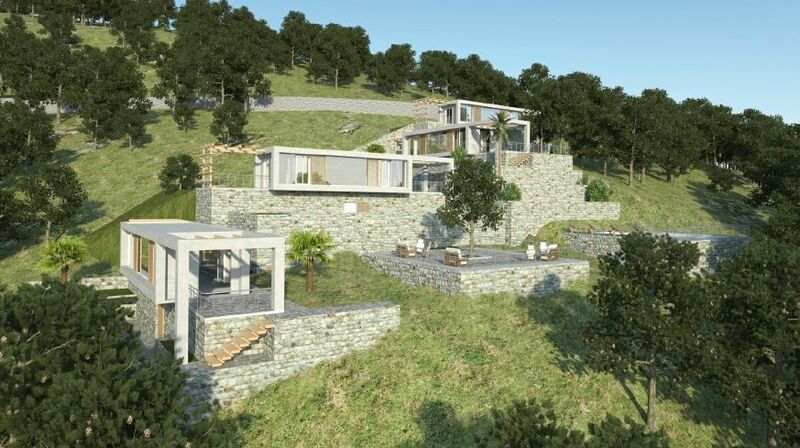 The connection of the individual levels and integration of terraces into the terrain is achieved by landscaping and accommodation of new groups within the terrace surfaces. Sports facilities and grounds are developed surface areas that supplement and activate the 100 meters strip area towards the seashore, highlighting activities for recreation in nature and direct connection to the sea. Structurally, these elements should impact the natural terrain only at a minimum (asphalt and concrete laying). The facilities are planned in accordance with the possibilities of usage of existing terrain (sand volleyball, badminton, bowling, tennis). The network of these sport's facilities is interconnected with pedestrian and cycling paths. Children's playgrounds will be integrated in green and park surface areas. The seaside promenade is the main pedestrian communication axis and participates in creating facilities linked to the sea. The seaside promenade in this function opens access to the seas to all visitors and the users of the zone. 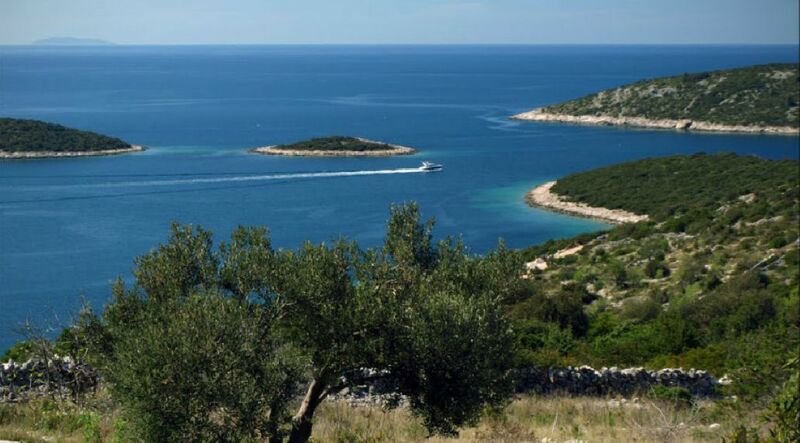 IT also enables movement along the sea towards Stari Trogir and Sevid, i.e. in the other direction towards Vinišce. The promenade route is not strictly functional, it follows natural directions existing here. Also, all used materials should establish a relationship to the overall environment , creating a harmonized whole. 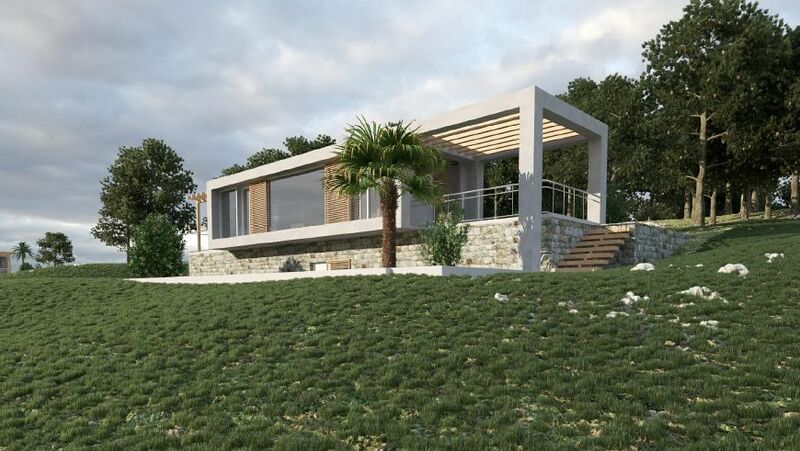 In our database, we have a large number of buyers who are looking for a specific property, and for them we are looking for the following properties - seafront villas with direct access to the sea from Sibenik to Makarska and secluded old stone houses by the sea on dalmatian islands. Tomas & Barbara, South Africa - "The entire process has been a pleasure and we are looking forward to our refurbished properties and extended summers in Croatia."